Common Carpet Stains and how to clean them. Keeping your carpet clean is very important for extending its life and making sure it looks good for its entire intended life. It’s important to vacuum weekly and deep clean when needed or every 18 months and spot clean. •	Soak up and blot spill. •	Leave solution on at least 5 minutes. •	Rinse with cold water then cover with white paper towel. •	Leave solution on 5 minutes or more. •	Rinse with cold water; cover with white paper towel. •	Use 70 % isopropyl rubbing alcohol. Apply the rubbing alcohol to a cloth or paper towel and do not pour the rubbing alcohol directly on the spot. Properly installed carpet makes it look and last much longer. If your carpet is not installed properly by professionals the life of your carpet will most likely suffer. Your room may not look as good as well. Coventry Carpets guarantees their carpet installation and takes pride in their work. Coventry is one of few carpet companies in Denver that actually do their own installations. In fact, most other retailers sub out their work. At Coventry our installation crews have over 30 years of carpet experience. A proper installation technique for carpet installation would be to use a power stretcher, only a knee kicker would be adequate for putting on new stairs. Remember, carpet is a textile, if seams are visible that does not mean it to a poor installation. seam tape and direct lighting are usually the reasons seam are more visible in some places verse others. Another good example of textile seaming would be clothing, take a quick glance at what your wearing, and you will notice seams typically far more than you do on carpet. Proper ventilation after carpet installation helps to remove the smell you can get after the new carpet has been put down. Try and keep your windows open and fans flowing to provide proper ventilation for a couple of days. Dust first and then vacuum. Start your cleaning by dusting your blinds, windows and furniture and then vacuum this dust up while cleaning your carpet. Take your time and do it right hitting the entire room thoroughly including the corners where dirt and dust can build up. Empty or replace the vacuum bags when they are half to two thirds full. Hiring a professional to deep clean your carpet at least once a year will extend its life. Coventry Flooring is the home of the lifetime installation guarantee! Give us a call today to get started on a new look for your home! How Is Commercial Carpet Different From Residential? Businesses experience a higher volume of foot traffic, so the flooring needs to be able to take the traffic without having to be replaced too soon. Commercial space with heavy traffic should select a commercial carpet to withstand the heavier foot traffic. Durability and economy are the goals of commercial carpet . Residential carpet is designed with comfort in mind and it typically uses a thicker padding. Residential carpeting usually has bigger pile and a looser loop design. Commercial carpet is designed to be sturdier so the material generally has a shorter pile and tight looping which provides the density needed to spring back into its original shape. Most commercial carpets are stain-resistant, which cuts down on how often they need to be cleaned. Nylon is the most used option because it is durable, stain resistant and attractive. Olefin is a little less durable but is much cheaper than nylon. For this reason it is often used in commercial spaces without a lot of foot traffic or if the tenant is moving within a few years. There are three major types of commercial carpet construction. Cut pile is usually the most expensive and the nicest. This type of carpet is plusher and is often used in high-end office space. Loop is the most common type used in commercial spaces. 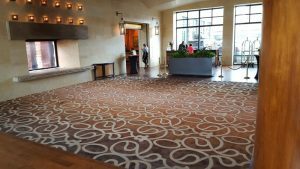 The fibers are looped not cut, which minimizes fraying and gives the carpet Big areas with a lot of foot traffic usually use this style of carpet. 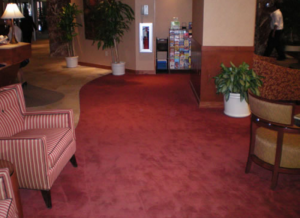 Carpet tile is used in all types of commercial applications for high traffic areas. The reason for the installation of carpet tile in high traffic areas is that the tiles in these areas can be replaced with tiles from lower traffic areas and the look of the building is easier to maintain. Tiles that have been damaged can be replaced with new ones. This movement of carpet tiles helps maintain the look of the carpet and it lasts longer because of it. Coventry Carpets guarantees their installation and takes pride in their work. We are one of very few carpet companies in Denver that actually do our own installations. Most other retailers sub out their work. Most of our installation crews have over 30 years of carpet experience. Coventry employees are reliable, honest, hardworking and pleasant to have in your home or business. Some notable installations are the “Brown Palace Hotel”, “Regis University” and “Briarwood Inn”.